What do Donald Trump and Andrew Carnegie have in common? Most people who are familiar with the business philosophies and leadership style of both of these famous U.S. business moguls would agree that Trump and Carnegie couldn't be more different in terms of ethics, reputation, character, and long-term admiration. But there are at least three things that Trump and Carnegie have in common. That is success, fame, and some interesting insights about motivation. The quotes from Trump and Carnegie that follow reveal the different perspectives of these two legendary U.S. business leaders, and the huge contrast between their philosophies about success, business, the meaning of life, and the pursuit of happiness. Donald Trump brought celebrity to real estate development and lavish audacity to a brand that bears his family name. In addition to his hotel, residential, and commercial property holdings around the world, the Trump brand name is on luggage, men's clothing, steaks, vodka, and a travel website. Trump has definite opinions not just about business and real estate, but also about just about everything. He also seems to relish the opportunity to express his opinions about everything and everyone to anyone who will listen. So there seems to be no limit to the number of quotes that can be gathered from Donald Trump. But just because Trump's quotes are "quotable" doesn't mean that the people who share them agree with them. For those who want to know what goes through the mind of this iconic multi-billionaire and controversial politician, these quotes about motivation from "The Donald" will give insight into the perspective of the man. "I don't make deals for the money. I've got enough, much more than I'll ever need. I do it to do it." "I try to learn from the past, but I plan for the future by focusing exclusively on the present. That's were the fun is." "I wasn't satisfied just to earn a good living. I was looking to make a statement." "I'm a bit of a P.T. Barnum. I make stars out of everyone." "In the end, you're measured not by how much you undertake but by what you finally accomplish." "Without passion you don't have energy, without energy you have nothing." Andrew Carnegie's views on motivation, leadership, and business are as applicable for managers today as they were when he was amassing his $300 billion fortune. 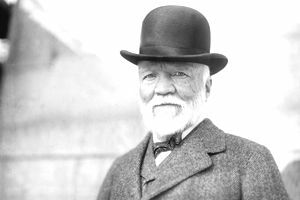 Designated by Forbes magazine as the second richest person in modern history, Carnegie spent the first half of his career leading the Carnegie Steel Company to outrageous profitability, and the second half of his career creating philanthropic ventures that still live on and bear his name nearly a century after his death. "People who are unable to motivate themselves must be content with mediocrity, no matter how impressive their other talents." "Concentrate your energies, your thoughts and your capital. The wise man puts all his eggs in one basket and watches the basket." "Do your duty and a little more and the future will take care of itself." "The men who have succeeded are men who have chosen one line and stuck to it." "There is no class so pitiably wretched as that which possesses money and nothing else." "Whatever I engage in, I must push inordinately." "You cannot push anyone up the ladder unless he is willing to climb." "You must capture and keep the heart of the original and supremely able man before his brain can do its best."